When I knew about the January challenge for the Creative Cooking Crew back in December I thought about making the most complex and technically challenging dumpling known to man and then I thought - why, a dumpling is simple fare and doesn't need all kinds of 5 star treatment to shine. 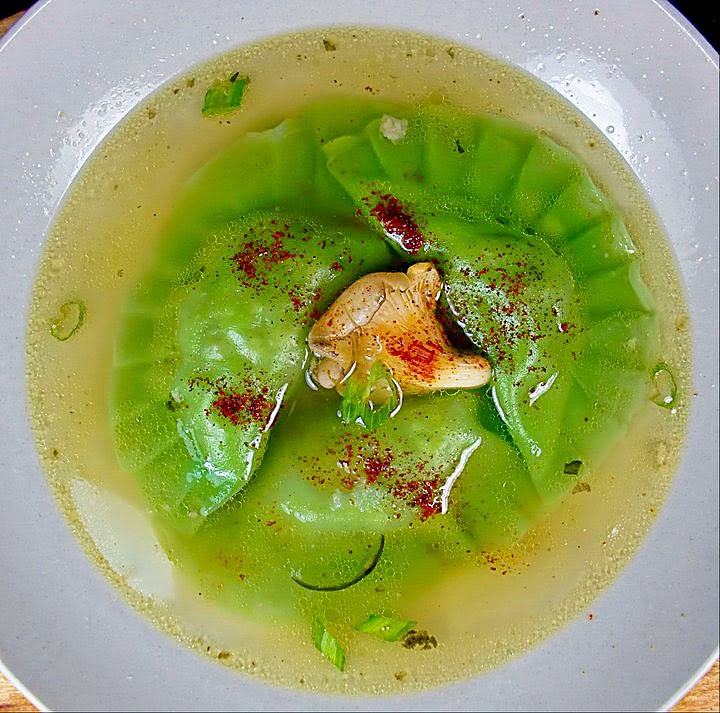 My dumplings are just that - simple. 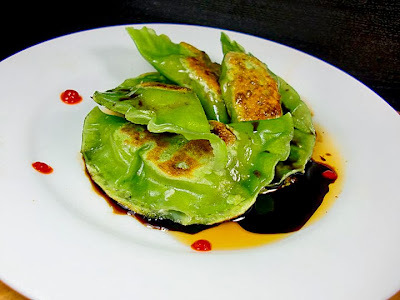 I made a spinach dough and I stuffed them with a nicely 5 spiced roasted minced duck and I served them two ways - one in light and savory duck broth and as pot stickers with a soy/ponzu sauce and a little Sriracha - both were delicious. Check back for the link for my partners in this little dumplingfest. The spinach dough rocks! It looks gorgeous on the plate. Nice filling and I couldn't choose between the 2 preparations so I'll have both please. Thank you for posting so soon! I have needed inspiration and a reality slap (I'm over-thinking). Dumplings-just as you said-are simple fare. Gorgeous photos as always, and you make them sound delicious, too. Very nice. Beautiful green color too. I could enjoy both very easily. I like the spinach dough - did you use just spinach juice or did you do something else, like spinach powder? The color is more uniform than I would expect from using the minced greens. They look like wonderful sea creatures. Love stuffed pasta -- mine is creamy this is much lighter. Great simple dish. Fantastic job with the dough and the filling. Awesome dumpling. such gorgeous dumplings! both preparations sound absolutely delicious!